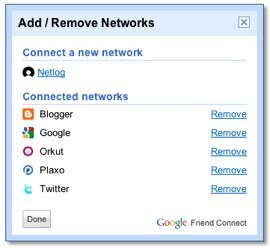 Google Friend Connect is now integrated with one of Europe’s fastest growing social networks, Netlog. Netlog, which has more than 45 million users worldwide, just implemented Google’s alternative to Facebook Connect, which allows users to sign in using any ID supported by Google Friend Connect (including Google, Yahoo, AIM, and OpenID) and share their activities with their existing contacts. Google’s integration with Netlog lets users sign into sites and blogs using Friend Connect with their Netlog ID and password. Users can use their Netlog profiles on the site, invite other Netlog users to join Friend Connect, and also share their Friend Connect activity with friends on Netlog. On the back end, Google uses standards like OpenID, OAuth, and OpenSocial technologies to enable Netlog and other social networks and sites to plug into Friend Connect. Netlog is growing fast, especially in Eastern Europe and the Middle-East, where it serves as the community portal of choice thanks to its viral nature and extensive language translation program. But even though Netlog is becoming increasingly popular in other parts of the world, this isn’t as big of a win for Google as the integration of a popular social network worldwide like Facebook, which officially has 200 million registered users around the globe (250 to 280 million unofficially). And Facebook just hit 307 million unique visitors worldwide in April, with MySpace trailing behind with 127 million unique visitors in April, according to comScore. By comparison, comScore’s worldwide unique visitor estimate for Netlog is 23.8 million.